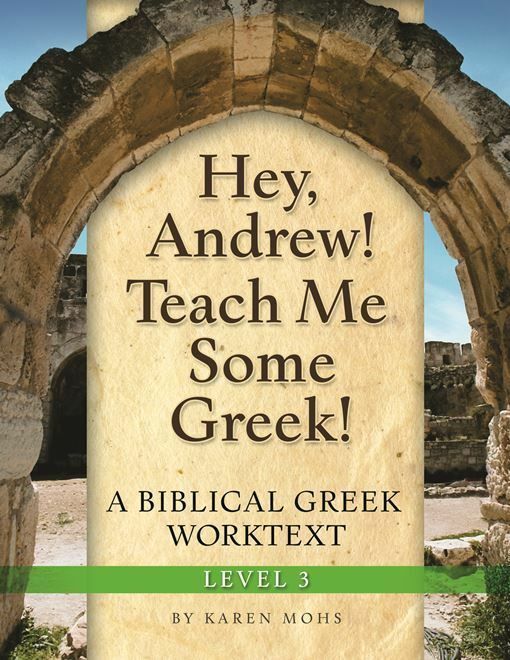 If you enjoy learning Greek roots or if you want to study God's word in Greek you may want to check out Hey, Andrew! Teach Me Some Greek - Level 3 Set from Greek 'n' Stuff. Greek 'n' Stuff was founded by Karen Mohs. Karen homeschooled for over 12 years and shares her love of teaching in the workbooks she now creates. She offers not only Greek for all ages but Latin and bible studies as well. Hey, Andrew! 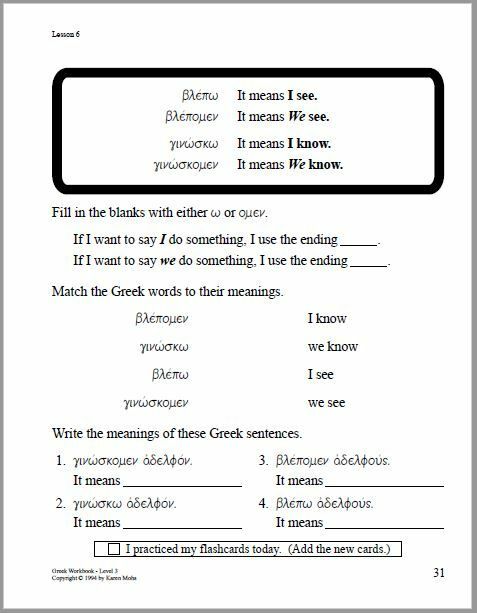 Teach Me Some Greek is recommended for children in the 4th grade to adults that are just beginning to learn Kione Greek. Kione Greek is not what is spoken today, but it is what was spoken when the new testament was written. We received the Level 3 Workbook, Level 3 "Full Text" Answer Key, and the Pronunciation CD for Levels 3-4. You may also purchase the answer key by itself, quizzes and exams, flashcards on a ring, sheet music for the alphabet song, or a Bible Copybook- The Gospel of John for the program. Level 3 reviews the alphabet that is taught in Levels One and Two. The students will learn to construct simple sentences with the special endings, work on vocabulary, and learn singular and plural forms. The workbook contains 180 pages plus flash card pages that can be cut out for practice. There are 36 lessons with an extensive appendix covering the alphabet, vowels, punctuation, word order, tenses, bible copy work, and more. Each lesson in Level 3 includes five worksheets one for each day. If you have an older student they may want to work at a faster pace. The first two lessons are alphabet review and cover three letters for each day. Each letter of the alphabet has its name, what sound it makes, three lines for writing practice, and a box that shows how to make the Greek letter. Lessons 3 & 4 cover vocabulary and include the Greek word, the meaning of the word, how it sounds, and an activity using the words. In Lesson 5 we start working with nouns, verbs, and gradually advances to reading more Greek. The Answer Key contains all the Worktext pages with the correct answer plus it has a recommended schedule of lessons. It includes further explanations, teacher tips, and indicates when to take the quizzes and exams. The Pronunciation CD is for Level 3 and Level 4. The first track is the alphabet song and the vocabulary words are pronounced starting in Lesson 3. There is also an appendix which includes the Greek alphabet, articles, and other words that are learned. I have been using this course with Alaina. She is twelve and only knew a few letters of the Greek alphabet before starting the program. She has been following the recommended worksheet per day right now because technically she is still on summer break. She has learned all the alphabet and vocabulary words from the first four lessons and is really starting to enjoy this course now that she is getting further into it. The worksheets include matching, writing, fill in the blank, drawing, and more. The flashcards are very important to help the student remember what has been taught. We love that each worksheet has a box to check if Alaina practiced her flashcards. That little box is a huge help during the summer time when we aren't on a regular school schedule. There isn't really anything to prepare before hand. I read the first couple of pages in the Answer Key to get a feel for what is going on and Alaina just got to work. Each worksheet has all the instructions and the only other thing is creating the flashcards. We found a Greek lexicon at a local thrift store a few years ago and we can't wait to learn enough Greek to be able to use that.